Those of you paying attention several of my past posts will recognize that I’ve enjoyed SlingMedia’s “Slingbox’ and the ability to send a home video signal out over a broadband connection. 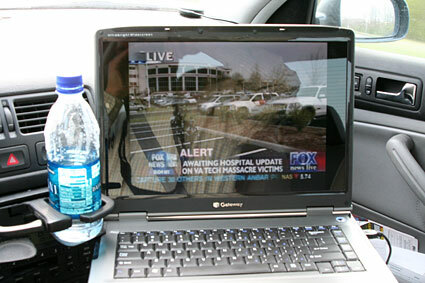 The home video feed (TV, Tivo, DVR, etc) is then received by a Slingplayer equipped device. Pretty cool technology that works amazingly well. A couple weeks ago I tested the beta release of the Slingplayer on my Palm Treo 700p and was impressed at how well the Sprint EV-DO network worked while driving in Ohio. Instead of using the mobile phone for a player this week, I decided to tether it to my Windows Vista OS Gateway notebook and see how well it ran. Amazing results — I managed to keep the connection going all the way from Cincinnati to Columbus Ohio with only 2 glitches in between. They were pauses … more than likely handoffs between cell towers … and as much as we all gripe about our cellphone service and dropped calls, my hat off to Sprint. Oddly though, while driving through Columbus, the connection would not hold?